diatribes, a strongly libertarian ensemble, began its existence in a Geneva basement in Winter 2004. In a playing way without restrictions, sounds, impacts, tones and noise meet sporadically, merging into each other until they are almost forgotten. 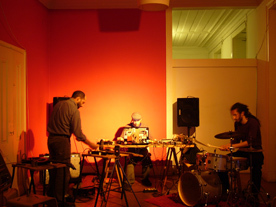 Free jazz, acoustic and electronic, the trio is capable of exploring the minute like the intense, adapting the improvised and experimental music languages of today. Initialy a trio, diatribes became a polymorphous formation, accuratly incomplete, extending its spectrum with guest musicians.